HONEYCERAM, a honeycomb-shaped catalytic substrate. 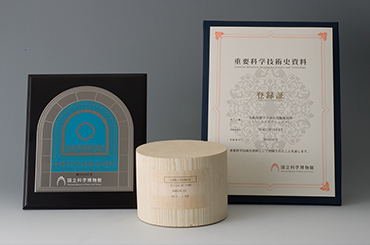 This product was made possible by the technology accumulated by the insulator business, the persistence to commercialize the honeycomb substrate business by any means possible, and the persistent efforts taken at the laboratory and production sites to ensure quality. 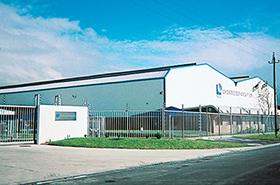 The sales representative who had been visiting Ford since around 1973 had this to say looking back at HONEYCERAM’s development: “They would agree to meet with us and hear what we had to say. 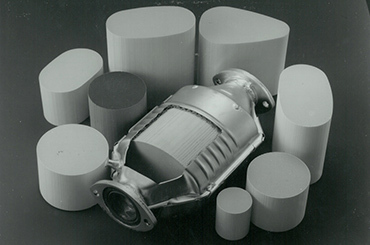 But it was clear from their attitude that they had no intention of buying critical automotive parts for exhaust gas regulatory compliance from a foreign manufacturer.” Since the 1970s, NGK had been researching honeycomb-shaped ceramics (HONEYCERAM) as catalytic substrates for automotive exhaust gas purifiers, and the company began sending out samples in 1974. 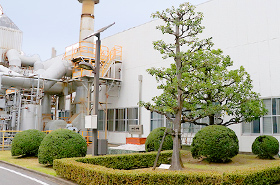 However, the world’s largest automobile manufacturer at that time was adopting pellet-shaped catalytic substrates for automotive exhaust gas purifiers, and Japanese automobile manufacturers were doing likewise. 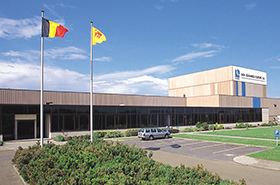 In order to break this impasse, NGK sent samples to a different automobile manufacturer that was considering the use of honeycomb-shaped substrates, and the sales representative often visited the company. The reason why they had no intention of buying from a foreign manufacturer is that they already had several candidate parts manufacturers for honeycomb-shaped substrates. Then, in January 1975, NGK received an inquiry about the price and delivery time for 1,000,000 units. Other than the inquirer’s number-one candidate, no samples from any other company had passed the standards. NGK quickly sent some evaluation samples by airmail to Ford in Detroit. However, Ford’s test results, delivered on December 12, 1975, were dreadful. Four out of six units had broken during the thermal shock test. Naturally, this meant that negotiations could not proceed further. 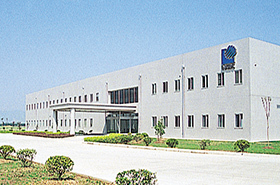 In the laboratory, we began efforts to improve thermal shock resistance. 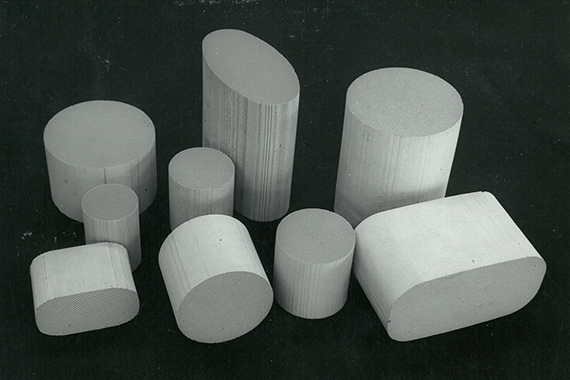 We continued the discussions, pulverized the raw materials, molded them in the kneading machine, dried and fired them, and evaluated samples. We worked even during the New Year’s holidays. 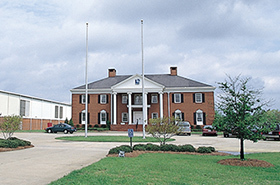 On January 12 the following year, a new base was completed, and samples were sent to Ford straightaway. 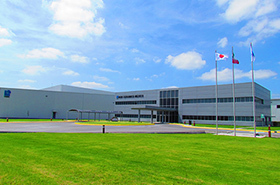 Ford came to Japan to check our production technology in March, while we were waiting for test results. In order to impress Ford with the magnitude of NGK’s production capacity, we showed them a tunnel kiln 130 m in overall length. 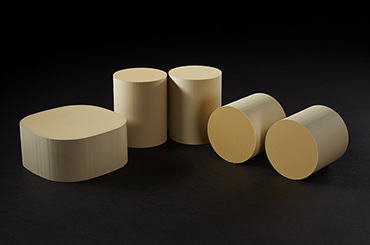 We explained our ability to fire and mass produce homogeneous ceramics with enthusiasm. 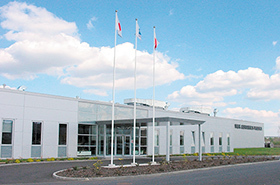 On April 9, the sales representative who had received the rest results from Ford sent a one-line telex to Japan from our New York office. “Test Results Excellent & Perfect.” It was just one line, but in that instance, all the hard work during holidays was rewarded. Based on those test results and their plant tour in Japan, Ford decided to order the product from NGK. 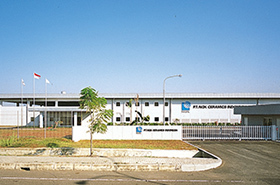 Commercialization began with a project that was launched in March 1976. The Insulator Division was responsible for production, and we launched a system with a monthly production capacity of 30,000. There were problems, however. “Unlike the electric power industry, where demand can be estimated years in advance, in the automotive industry, you can only gauge demand one month at a time. We had to shift our thinking and change our mindset,” said a project member. Next was the price negotiation. Production costs inevitably increase before mass production begins. Accordingly, what we decided was first to manufacture at a loss, and then to make the business profitable through orders and mass production. It was an unprecedented decision, but it let us conclude negotiations, and mass production accelerated. In April 1976, we set about establishing a plant dedicated to HONEYCERAM on our main plant premises, and we began shipping in December the same year. After reaching monthly production volume of 120,000 units in October 1977 and being more or less successful at accommodating requests for thin walls HONEYCERAM through the efforts of our laboratory, we saw the light at the end of the tunnel for the development of our manufacturing technology. 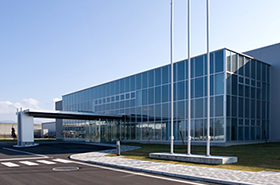 The number of automobile manufacturers using it kept increasing from that point, with manufacturing plants expanded not only within Japan, but to Europe, the US, Indonesia, South Africa, China, Poland, Mexico, and Thailand, and HONEYCERAM grew to become NGK’s main business. The honeycomb business had started in the 1970s and blossomed greatly in the 1980s, and it was based in the Insulator Division. 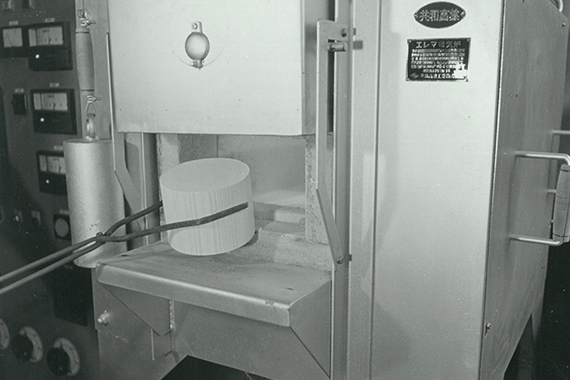 The consensus opinion of people involved in commercializing HONEYCERAM was that the honeycomb ceramics business could not have succeeded if it had been missing any of the following: the traditions of the Insulator Division to take advantage of, the persistence to commercialize the honeycomb substrate business by any means possible, persistent efforts taken at the laboratory and production sites to ensure quality, and confidence in profitability through mass production. 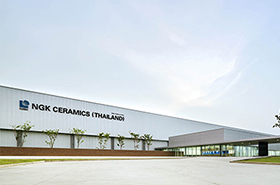 NGK CERAMICS (THAILAND) CO., LTD.